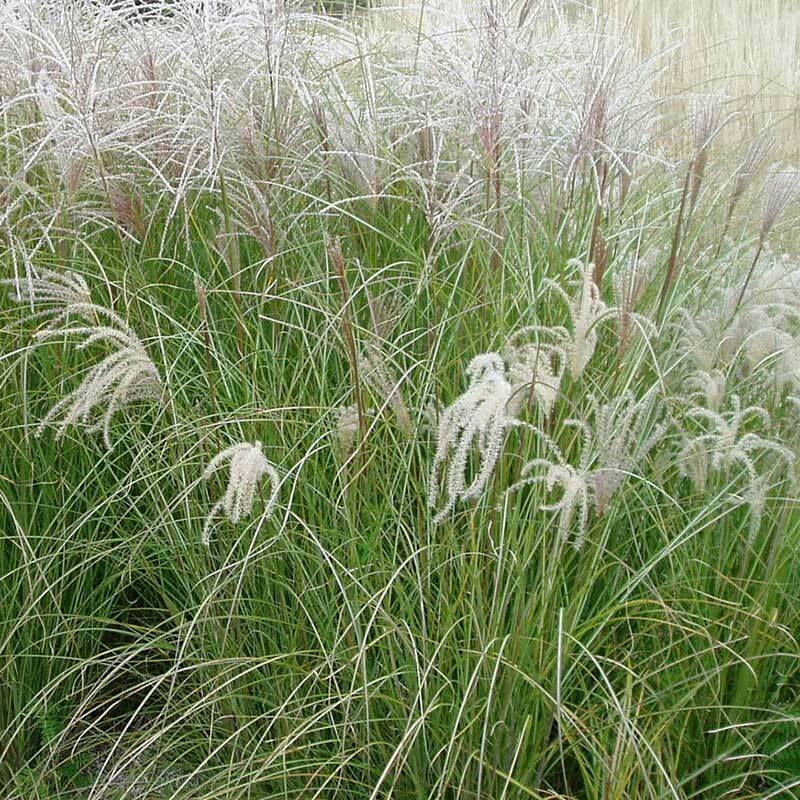 The grasses on this page grow most actively during the warmer months and flower in late summer or fall. 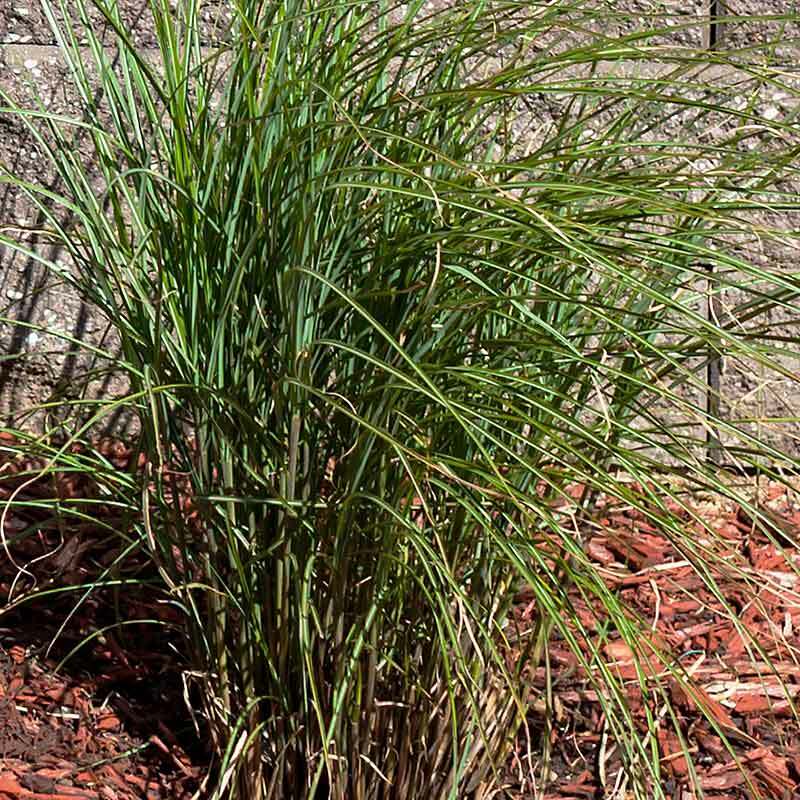 Since they go completely dormant in winter, it's a good idea to plant before fall. 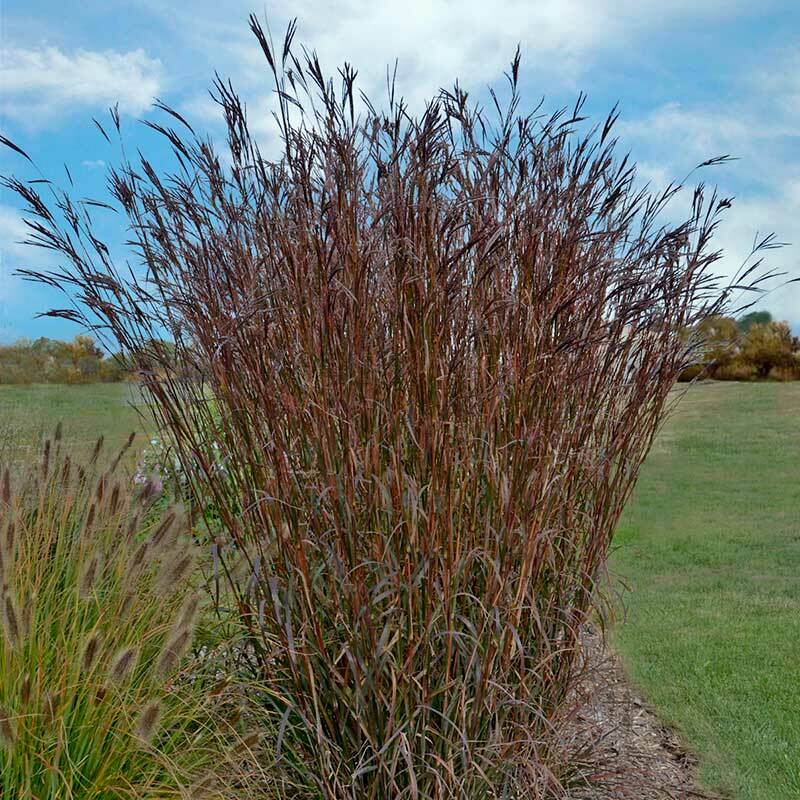 This long-lived grass forms a tall, upright clump of green foliage that transitions to red then smoky purple by midsummer. Bright orange-red pollen. 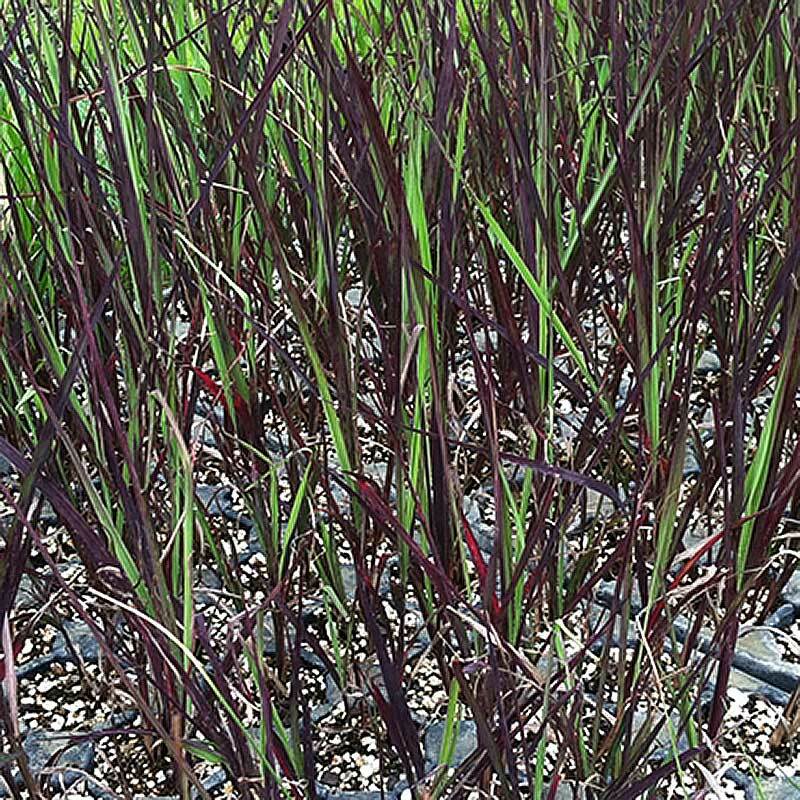 Bright green blades and stems quickly turn rich purple and dark reds for a striking blended display. 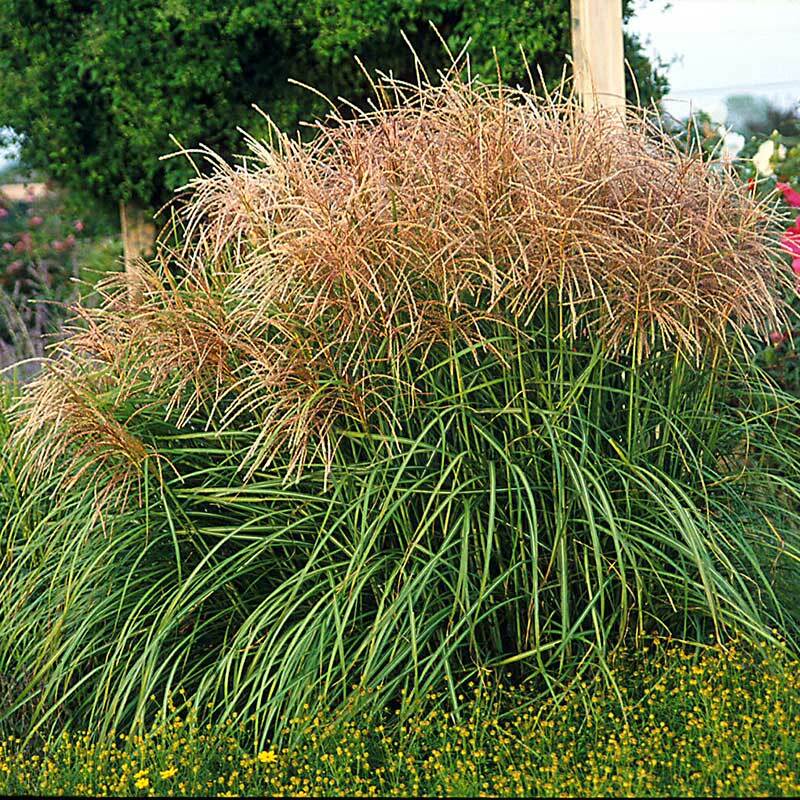 This grass is great in containers since it forms a tight, vase-shaped clump of blue-green foliage that turns red in the fall. Does well in beds as well. 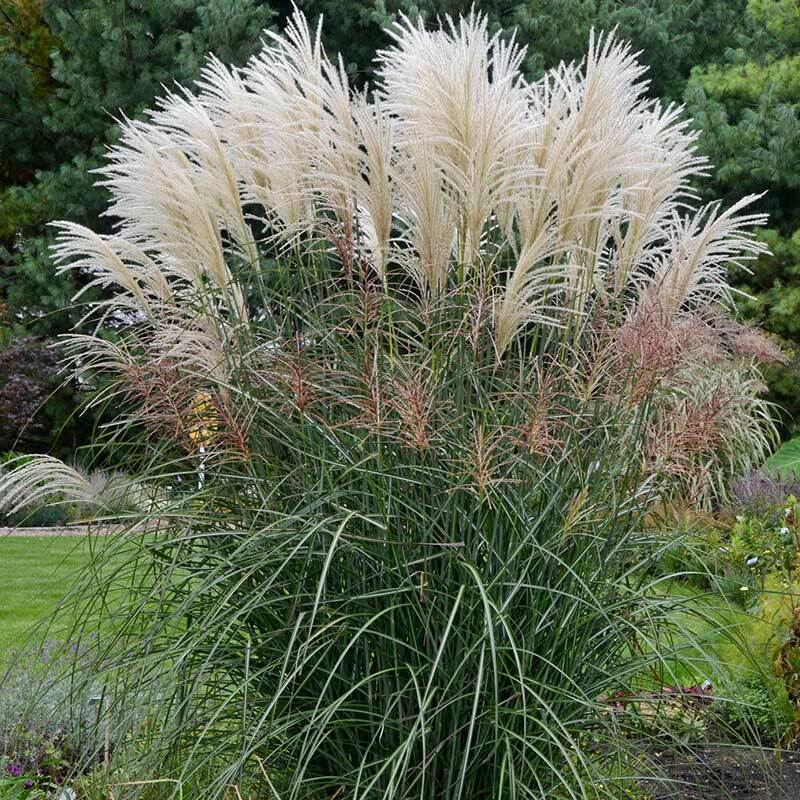 Feathery, cream plumes form on 5½' upright clumps. Narrow white mid-rib. Good yellow fall color. Very hardy and vigorous. 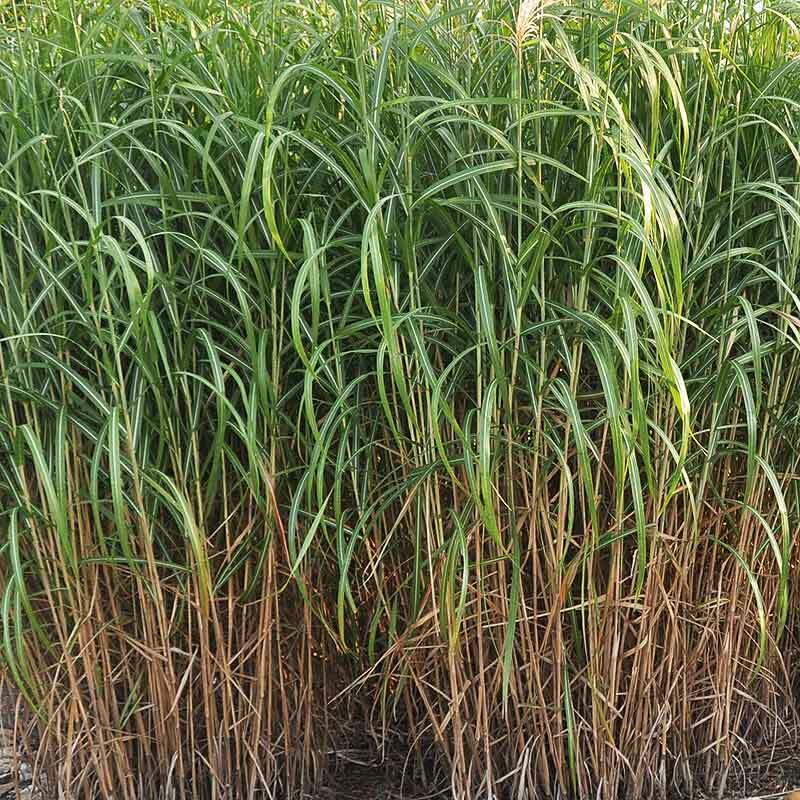 Broad, bright gold bands span rich green blades horizontally. Full, compact stands. 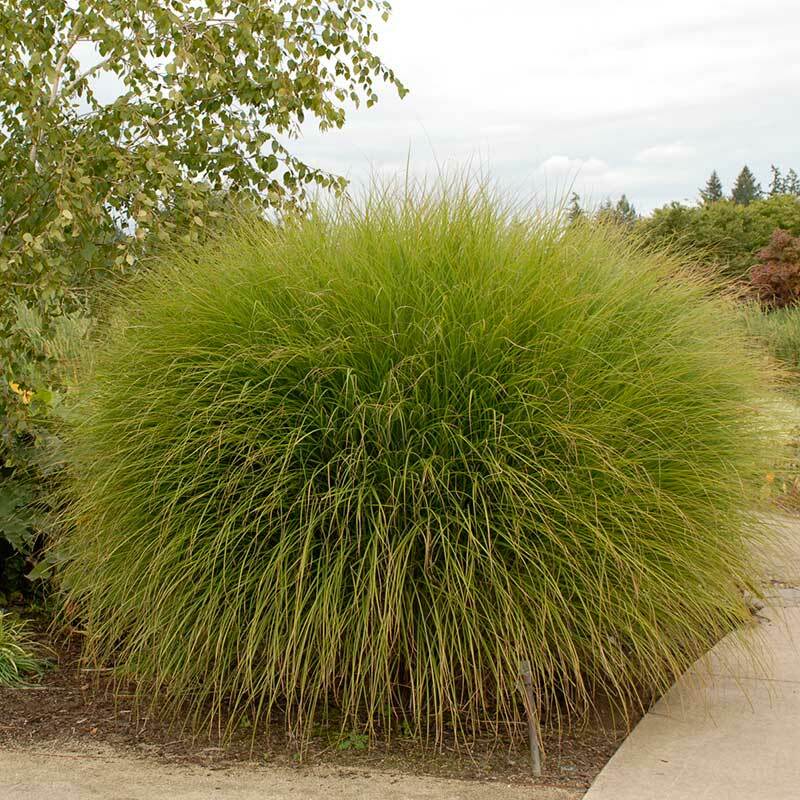 4-5' green and white foliage has a compact growth with silky, pink plumes. Also works well in containers. Perfect in northern climates. Earlier bloomer with a secondary flush of coppery purple plumes. 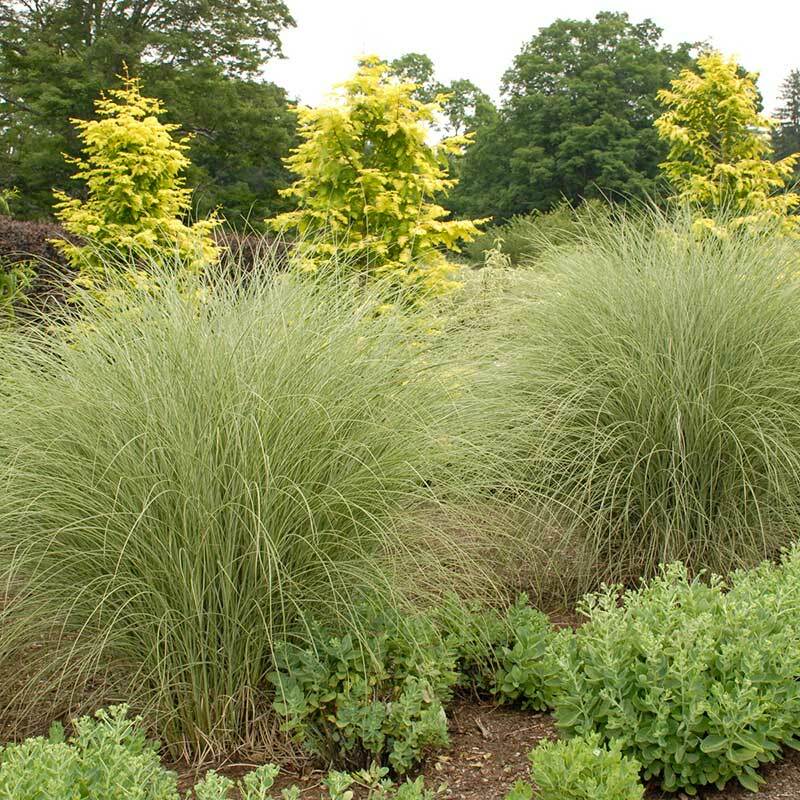 Flowers turn to a creamy tan with a tall clump of dark green leaves with a white midrib. 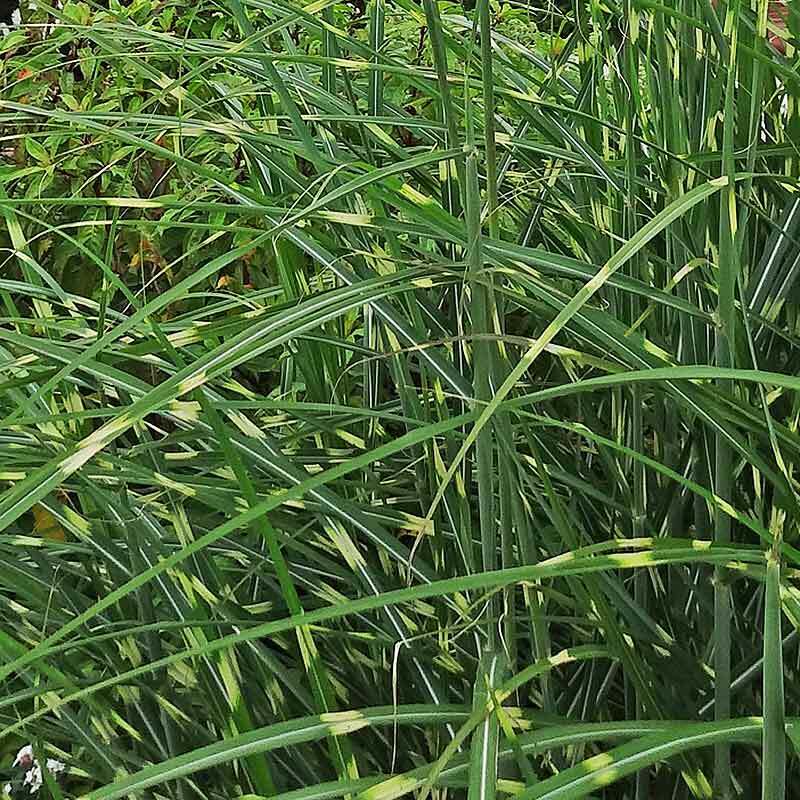 Magnificent upright clumps of wide green leaves. Flower stalks soar to 10'. 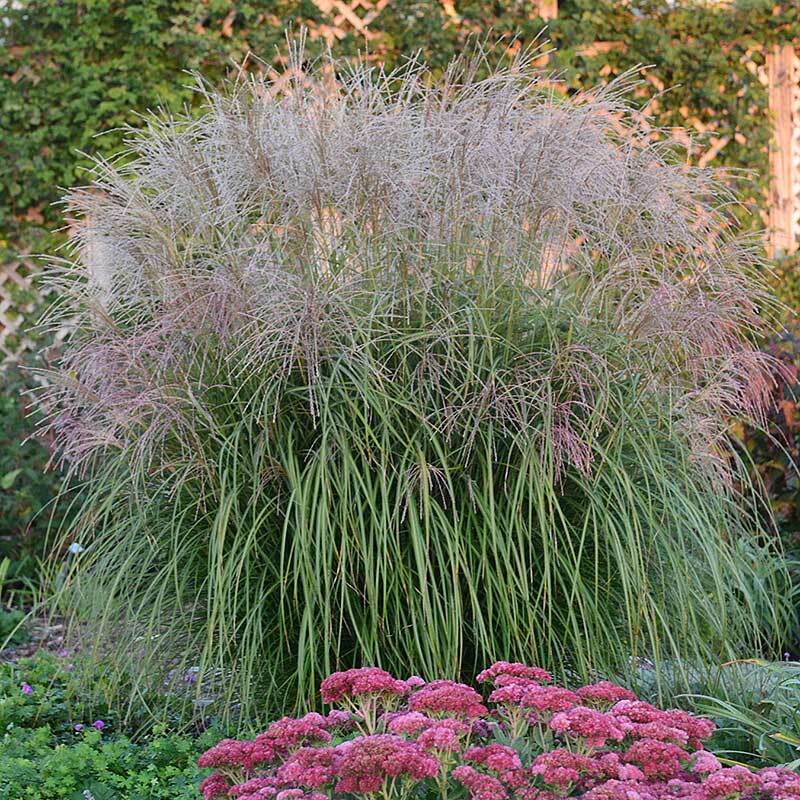 Light pink plumes mature to silver. Won't self sow. 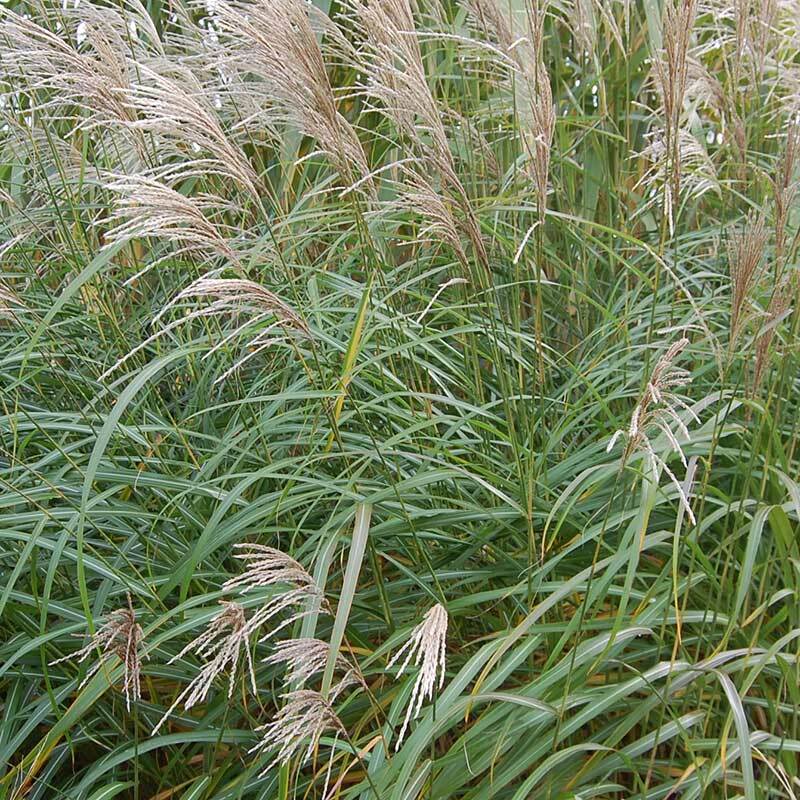 Slender leaves; graceful arching habit. The standard against which all others are measured. 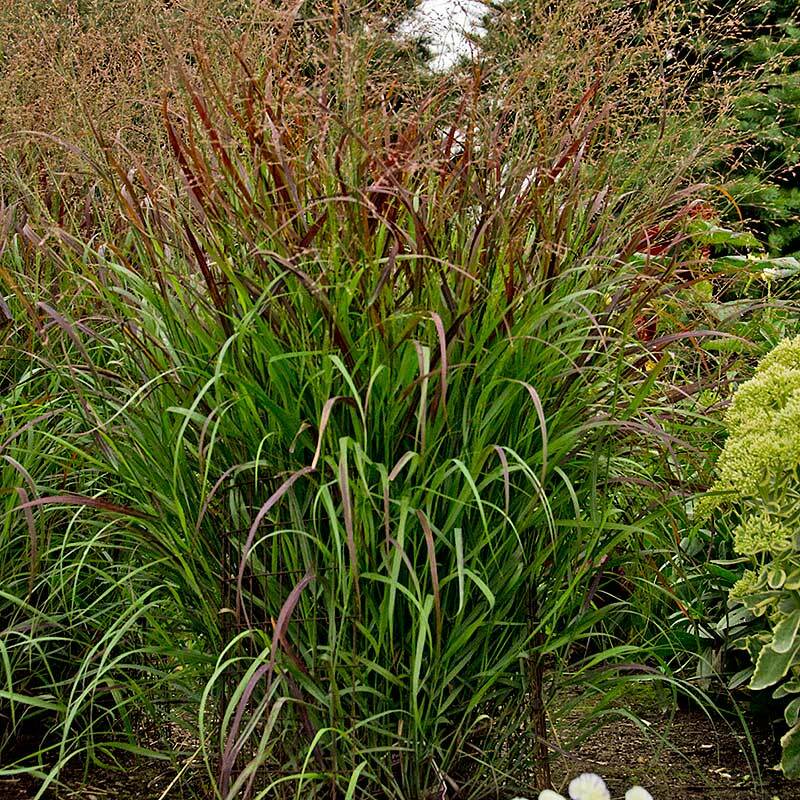 Profuse, full burgundy plumes sit atop white ribbed green leaves. Reliable reddish blooms, especially for the north. 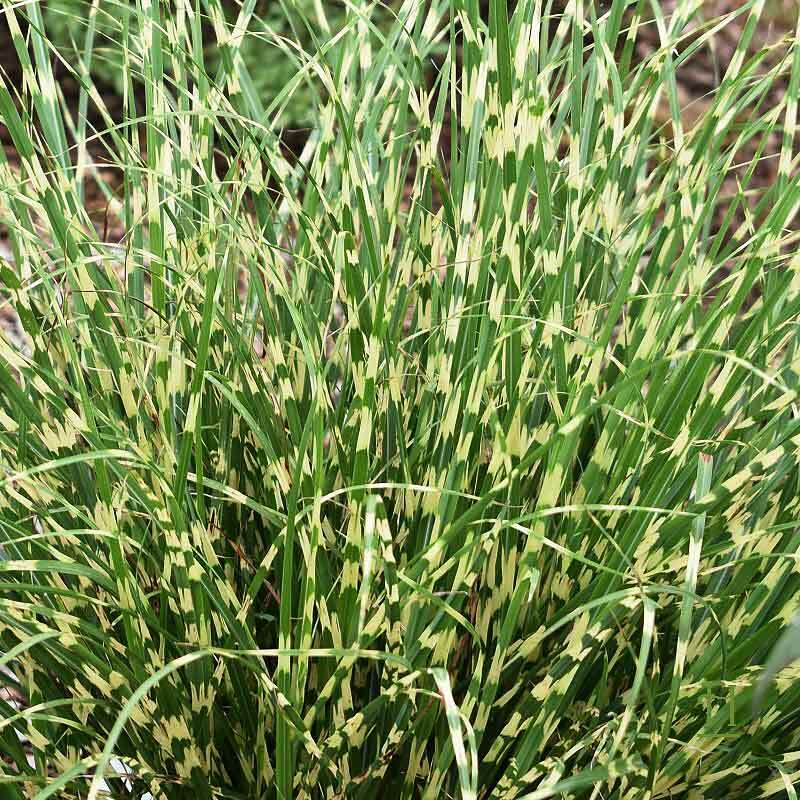 Green leaves have gold bands and form a rounded shape. Extraordinarily large, abundant blooms emerge purplish pink, then mature to silver. Fall foliage changes through summer from green to bronze. 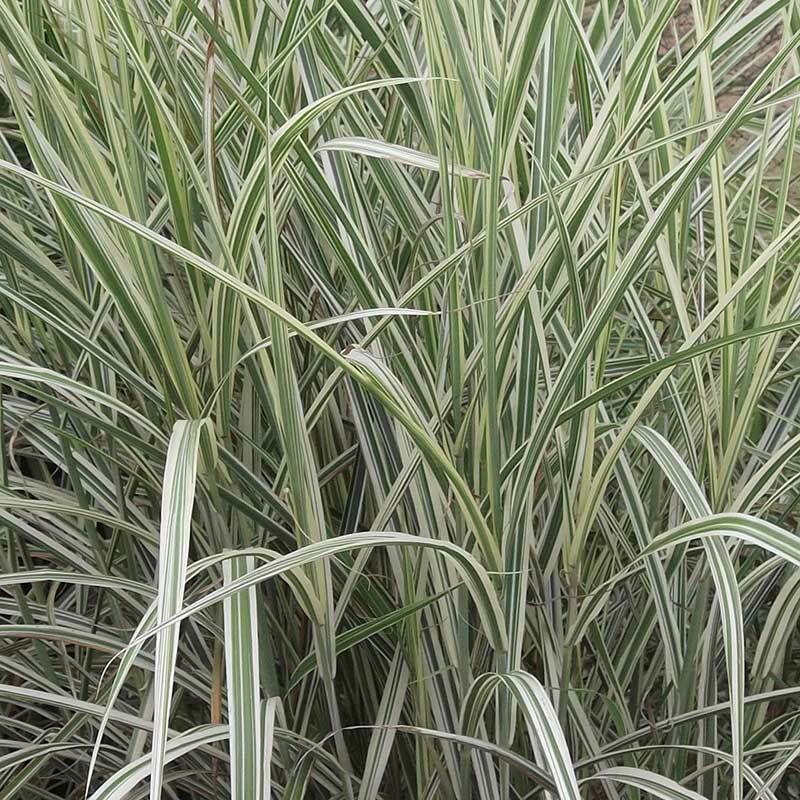 Elegant, narrow, fine, silvery green leaves appear to glow when backlit. 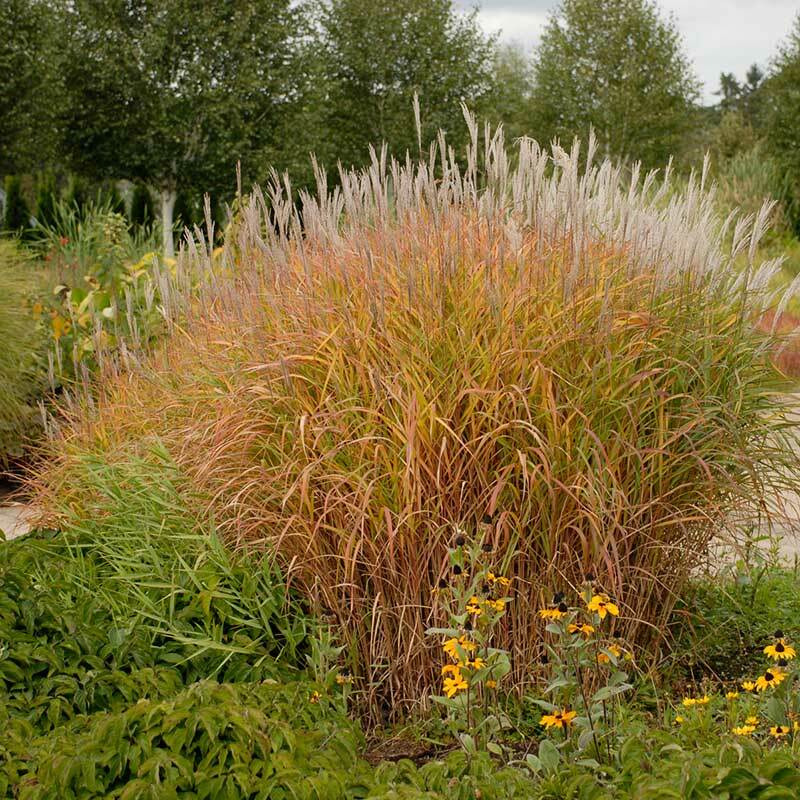 Arching clump topped with bronze red plumes. 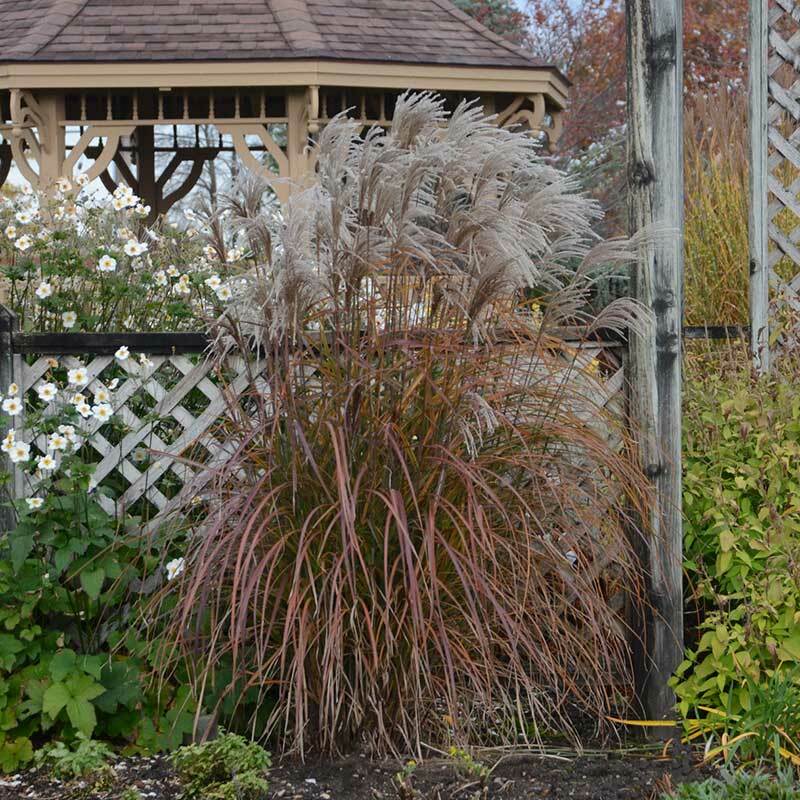 Spiky textured foliage grows upright with pinkish copper blooms. 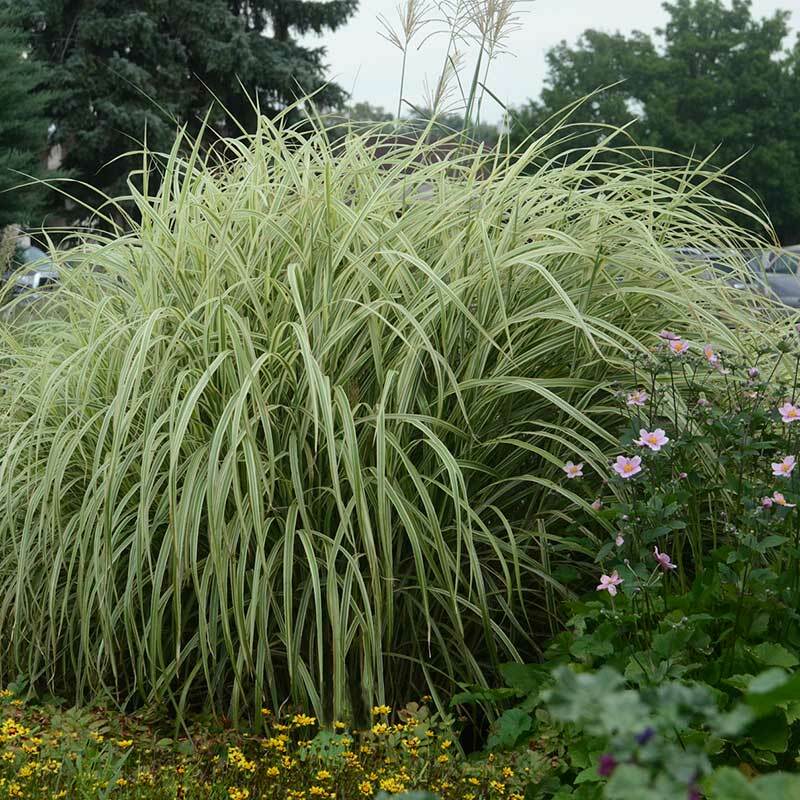 Reddish hue develops through summer; entire plant turns red in fall. 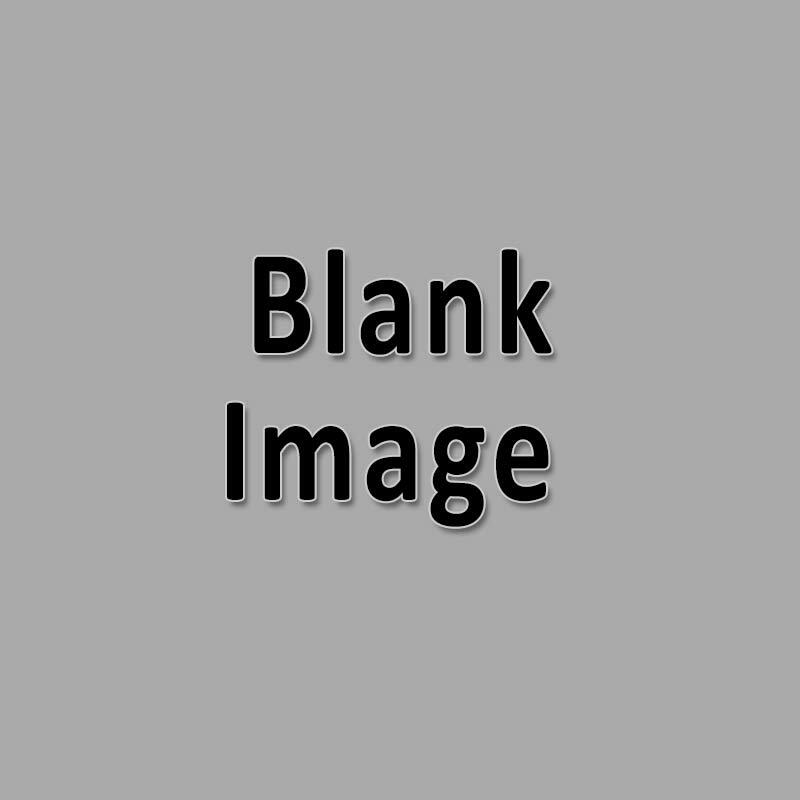 Compact with strong, creamy-white stripes. Outstanding in pots. Gold bands on green foliage, upright with pinkish copper blooms. 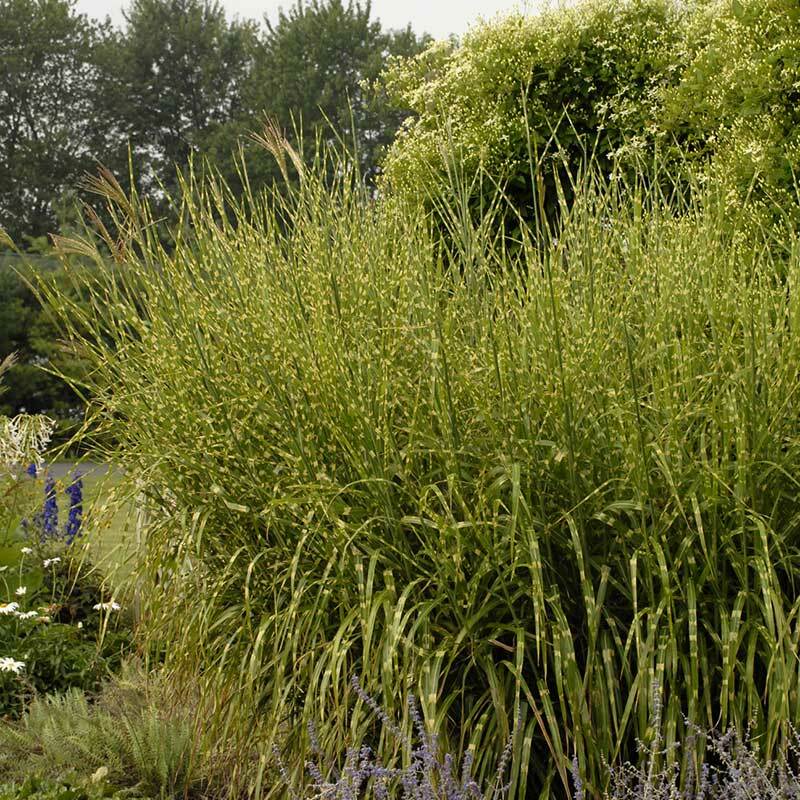 Very narrow foliage gets gold and copper colored seed heads in August. 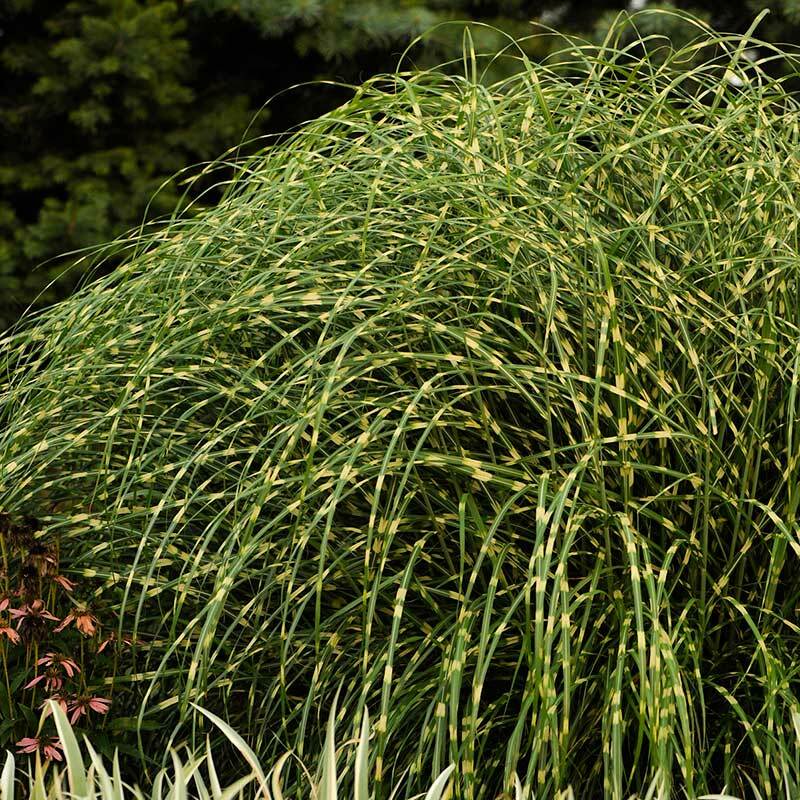 Large, feathery seed heads rise high above graceful arching mounds of deep green blades with silver midribs. One of the most cold hardy of the species. 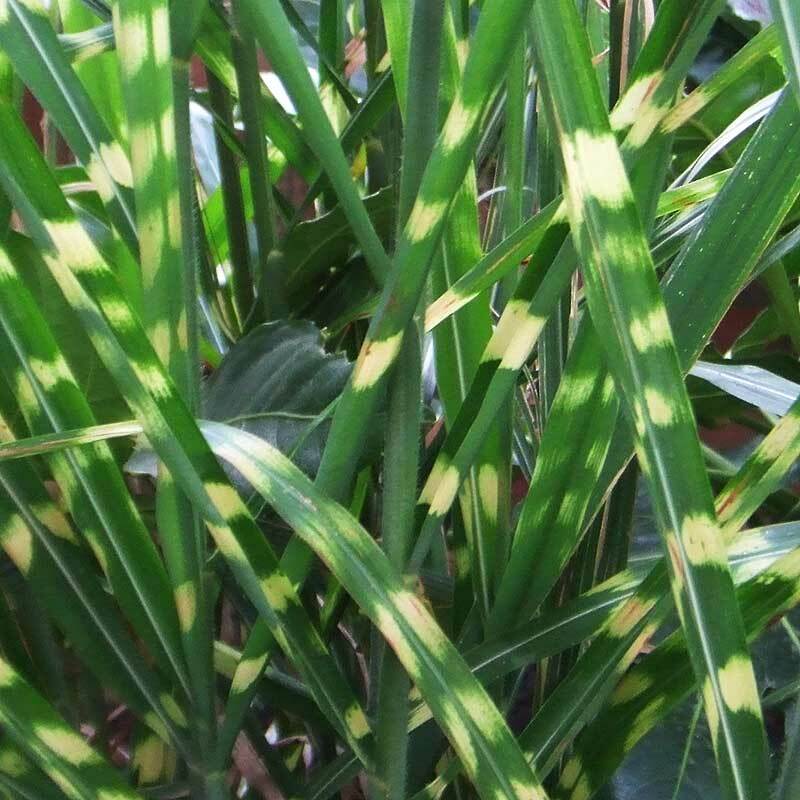 Strongly upright yellow banded leaves has a gracefully flowing stand. 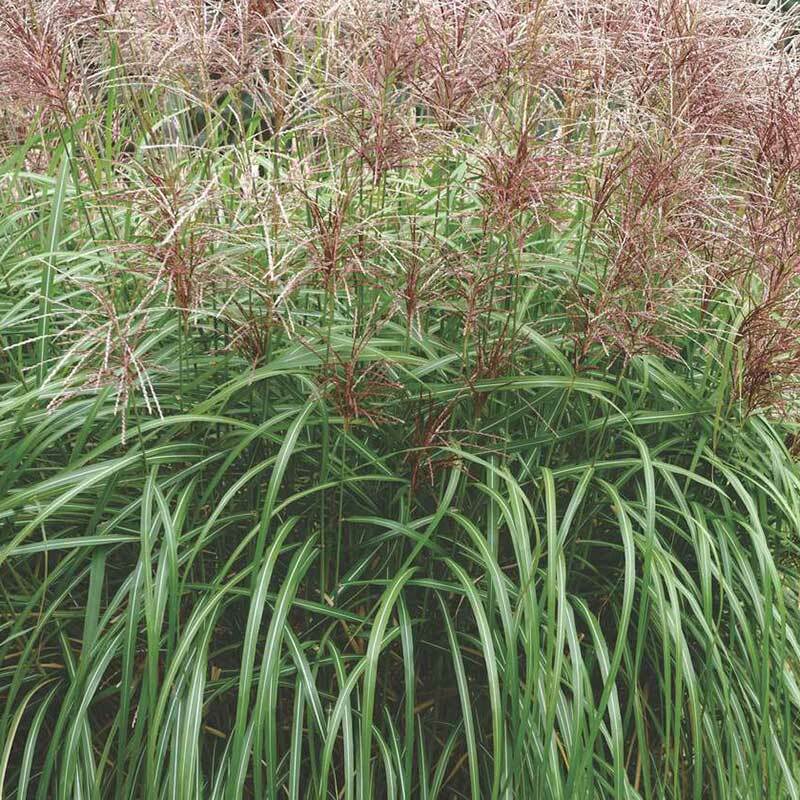 Gold horizontal bars on green leaves have an arching habit and pinkish copper blooms in September.